All aboard for the U.S.S. Hornet Overnighter! Sleep in the bunk like a sailor and explore the depth of a ship that saw combat from WWII to the Vietnam War! The cost is $75 per person and includes the cost of meals, ship tours, a flight simulator ride, a certificate of participation and coupon for a future daytime visit, as well as a commemorative patch. Free parking. R.S.V.P and payment due by Friday, November 4. Payment can be brought to the Pack Meeting or dropped off at Pack 1776 mailbox inside the Coyote Creek School office. Class A and B uniforms required for all Scouts. Click here for information on itinerary, sample meal menus, safety information, what to pack, and more. Avast, me hearties! Spend a night going back in time and experience first-hand what it was like to work and sleep aboard a permanently moored turn-of-the-century tall ship. 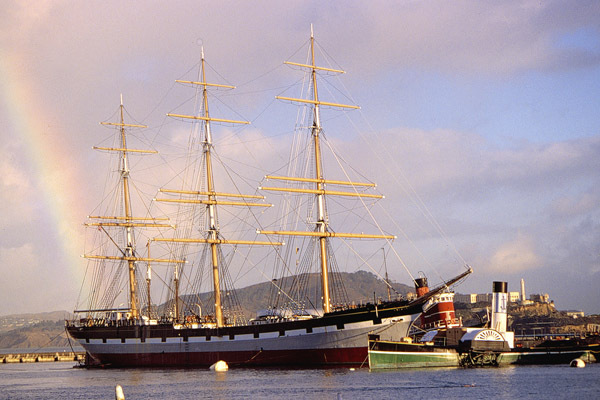 Celebrate San Francisco's maritime heritage and travel back to the "Age of Sail". Try your hand at traditional maritime tasks such as raising a sail, swabbing the deck, rowing a longboat, and riding a bosun's chair into the rigging. Sleeping bag, warm clothes, pillow if desired, personal items you need (toothbrush, etc). No electronic items allowed. Eat dinner before arriving at the pier. Feel free to bring your own late night snacks. Breakfast (bagels, croissants, danish, juice/milk etc.) will be provided by the Pack the next day. Free parking is available on the first come first served basis at the north end of lower VanNess next to the aquatic park, or in the nearby Ghirardelli square parking garage at a discounted rate for overnight parking. Carpooling strongly encouraged. Tour of the Balclutha. This can either be on Sunday morning after breakfast or Saturday evening. 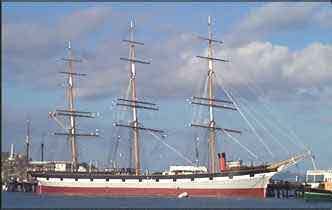 Activities on the Balclutha. The last time scouts learned about pulleys and swabbed the deck. Tour of the remaining boats that are part of the San Francisco Maritime Association (including the USS Pampanito) on Sunday. Due to the limitation on the number of attendees, this is open to Scouts and 1 parent/guardian only. We will open it up to siblings if we have open spots available. Please RSVP and drop off your check in the pack mailbox. Your check secures your spot (response to the form does not). Please make your check payable to Pack 1776 and include your scout's name, Den number, and your email address so we can reply with confirmation. Hope to see you onboard. 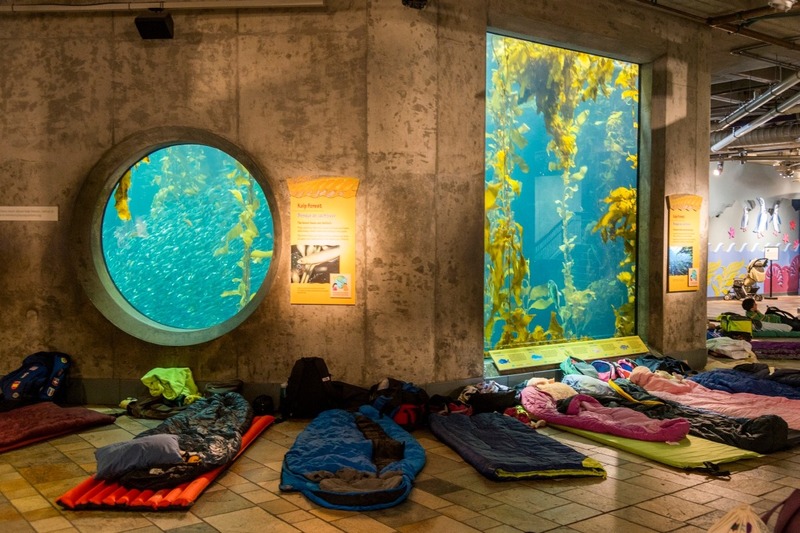 Let’s explore the Aquarium after hours and sleep with the sharks…in a good way. Signup and turn in your check made to Pack 1776 by October 30th at the Halloween party or in the Pack mailbox. Only paid participants are guaranteed spots. Also, in order for this event to happen, we need at least one BALOO trained adult to attend. Dinner is not included. Be sure to eat before arriving. Details of a possible group dinner will be sent out at a later date. The entire group has to be present for check-in and late arrival may not be accommodated. The Aquarium is a flash-free facility, camera flashes and flashlights can cause harm to the animals. Parking is not included - read the Planning Guide for parking info - the aquarium does not validate parking but there are several overnight parking facilities nearby. 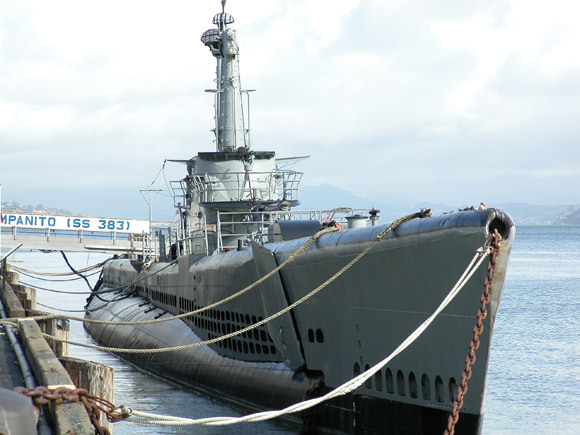 This year we are heading to the USS Pampanito for a private tour of the submarine and a sleepover on June 14-15 ! The cost is $30 per scout. Adult or siblings are $40 each. Siblings must be 6 years old to attend. to Esther Wooten or Marcos Perez. Respond quickly - event will sell out! 48 people maximum. Only paid reservations can reserve a space. Get ready for a night full of adventure and fun! The “Bedtime with the Beasts” trip to the Oakland Zoo is happening on Saturday, March 8th! The cost is $65 per person. Cub scouts will be partially subsidized. Immediate family members and siblings (must be 6 years or older) are invited. Please indicate how many cub scouts so we can determine our subsidy. Please respond by January 18th. Once the subsidy is calculated, payment will be due by January 25th. Payments are non refundable. An increase in participant count after January 29th is subject to availability and payment is due at the time of request. The program begins promptly at 7 pm. Departure at 10 am the following day. It's very important for everyone to arrive a few minutes early - gates will be locked after group arrival. Zoo gates are locked until 7 am - no early departures allowed except for medical or family emergency. The Auditorium floor is concrete - so sleeping pads or air mattresses are encouraged. You can bring in your own food. The Island Cafe opens on Sunday for the public from 10am to 4pm. Even though we'll be sleeping indoors, we'll be spending plenty of time outdoors, rain or cold, so wear weather appropriate clothing and close-toed shoes. Parking is included; bring your ticket with you to check-in for validation. The Zoo requires a signed Liability Release form for EACH adult and EACH child attending the Sleepover. Get ready for the wildest sleepover ever! The “Penguins+Pajamas” trip at the California Academy of Sciences in San Francisco is happening on Saturday, June 15th! The cost is $79 per person. Cub scouts will be partially subsidized. Immediate family members and siblings are invited. Please indicate how many cub scouts as we need to know the count in order to determine our subsidy. Please respond by March 15th. Once the subsidy is calculated, payment will be due by March 29th. Refunds are available only until 1 month (May 14th) prior to the event. After that, the costs are not refundable. An increase in participant count after March 29th is subject to availability and payment is due at the time of request. Please make checks payable to “Pack 1776”. Admission to the Sleepover begins at 6:00 pm, and the event ends at 8:00 am the following day. Sleeping areas — African Hall, Aquarium, Lower Swamp and Islands of Evolution exhibit — are available on a first come, first served basis. Areas may not be reserved. Dinner and drinks are available for purchase. The Academy Café is open from 6-9pm. The Academy Lab Junior Store is open from 6:30 - 9:30 pm in the evening and 7:00 - 8:00 am in the morning. Penguins+Pajamas is a program for children between the ages of 5 and 17, who must be accompanied by an adult chaperone who is 25 years of age, or older. There must be one adult chaperone for every group of up to 5 children, and adults cannot attend unless there is a child in their party. The Academy requires a signed Waiver of Liability form for EACH adult and EACH child attending the Sleepover. For children, the Waiver must be signed by the child’s parent or guardian. The Waiver of Liability must identify the adult who will be responsible for the child during the Sleepover. Only original Waivers will be accepted; no faxes or copies. No one will be admitted without a completed Waiver. RSVP here no later than 6/13, Wednesday. Please make your check payable to "Cub Scout Pack 1776" and send your payment to Cubmaster John. Avast, me hearties! Spend a night going back in time and experiencing first-hand what it was like to work and sleep aboard a permanently moored turn-of-the-century tall ship. Celebrate San Francisco's maritime heritage and travel back to the "Age of Sail". Try your hand at traditional maritime tasks such as raising a sail, swabbing the deck, rowing a longboat, and riding a bosun's chair into the rigging. Earn your "sea legs" upon successful completion of a night aboard the tall ship Balclutha on Historic Hyde Pier. Great experience for you and your scouts! See the sign up sheet for detail. All aboard for the U.S.S. Hornet Overnighter! This exciting event happens only once every other year and is one of the major annual highlights for our Pack. Sleep in the bunk like a sailor and explore the depth of a ship that saw combat from WWII to the Vietnam War!. The cost is $60 per person and includes the cost of meals. R.S.V.P is due by Friday with payment due by Monday. Payment can be brought to the Pack Meeting this Friday or can be dropped off at Cubmaster Macey's house (in the mailbox please). Class A or B uniforms are required attire for all Scouts. If you are a Bear Scout or higher this is your FINAL opportunity to take part in this privilege! Go here for information on itinerary, sample meal menus, safety information and more.